February | 2010 | How green is my valley? Last Thursday I trotted along to hear an excellent talk on poverty by Lindsey Pearson, the Yorkshire Regional Manager of Christian Aid. She emphasised climate change and the effect it’s having on farmers in the (not very) developing world. She reminded us that the people who suffer most from climate change are the ones who’ve done least to cause it…though of course she was preaching to the converted in my pew! The subject matter was necessarily upsetting – the cycle of violent flood and drought in Burkina Faso makes our little weather problems seem so trivial. The single most depressing moment, for me, was when she asked us whether we thought global poverty could be overcome. My hand was one of the few to be raised! We happy few are in good company – Ban Ki Moon is on record as saying that there is a clear and achievable solution. But oh, how bad is it if even the majority of people in Hope Baptist Chapel think that we’re stuck with calamitous poverty! One recent comment here from Carla Boni said, among other things “Let’s have some ideas from a party who has never been in power and never will be”. I don’t suppose this was Carla’s intention, but she got me thinking about ‘power’. Of course she’s right in the narrow historical sense, in that UK Greens have never formed a government. 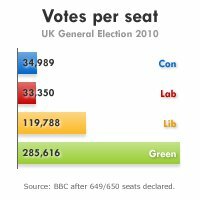 But most of us in the Green Party are not motivated primarily by a desire for ‘power’ (we probably wouldn’t have nailed our colours to the Green mast, if we were power-hungry!). Most Greens believe in organic change, from the bottom up, and from that point of view there’s plenty of evidence of positive change! Maybe not power as Carla means it, but a growing sphere of influence. It’s also perfectly possible that we could have (a) a hung parliament with Green MPs (b) proportional representation (c) Greens in a coalition government within a few years, so I’d advise Carla not to be too secure in her certainties! So far, so good. But there’s an unwelcome corollary, which Carla inadvertently alludes to. Those parties which do have ‘power’, in her rather narrow sense, attract the type of people who are motivated by it. This means that we’re lumbered with some rather unpleasant people at the top of the tree! I hasten to add that this doesn’t apply across the board, and most politically active people are motivated, at least in part, by a desire to ‘do good’ as they see it. But hunger for power weeds more people out the higher you go. Good Labour MPs like Alice Mahon and Chris McCafferty stay on the back benches while the likes of Jacqui Smith, Geoff Hoon and the delightful Lord Mandelson wield the ‘power’. Just a thought…… do feel free to comment! I’m determined to keep reading proper books alongside the acres of campaign stuff I have to read. So I’ve just finished The People’s Act of Love by James Meek. Set in Siberia in 1919, it’s caused me to ruminate on what happens when societies go through abrupt changes – chaos, basically! Russia went from Chekhovian polite(ish) society to brutal meltdown, virtually overnight. This book, which I enjoyed after a slow start, leaves none of the brutality to the imagination. I could happily have lived without all the castration details – eeuw! Musically I’ve been stuck in Dylan mode the whole week. It happens sometimes – it’s a minor compulsion – and letting my MP3 run alphabetically through the 40+ albums sheds all sorts of interesting light on the oeuvre. I know, I know, but it’s just so….good! Our story as published is essentially correct with a caveat. The report we quoted is indeed UNICEF, dated 2007 details as follows and we have quoted it accurately. Page numbers listed. The same stats as used by save the Children and UNICEF. But it seems there may have been been a more up date figure showing a fall. If so the fall is very recent & probably due to the “surge” which improved security in Iraq . It may mean that technically, Blair can claim a drop and is right thanks to the surge and the efforts of the aid agencies . BUT of course, it still means that hell of a lot of babies and children died as a result of the invasion than would otherwise have died had there not been a war, and that is pretty obvious. including the 122,000 who did die just in 2005. Campbell & Blair are still on very shaky ground claiming that the war has done wonders for child survivability because it obviously killed tens of thousands of children along the way one way or another. So apologies from me and from Private Eye for not getting it exactly right, although Blair and Campbell have sexed up the stats to serve their case. Fancy that! Because I’m getting some interesting comments, I’ve put up most of the recent crop. The only ones I’ve trashed were a couple of exta-nasty specimens. No need for that kind of thing! I welcome challenging comments and have already responded to several – see below. With regard to Gordon Brown and Roosevelt…not sure if this is facetious or not, but I can assure you all that we got there first! See http://www.neweconomics.org/publications/green-new-deal from July 2008. Caroline Lucas was one of the authors of this paper, which has punched well above its weight in shaping the recent economic discourse. We don’t mind Gordon and others pinching our policies, as long as they put them into action!